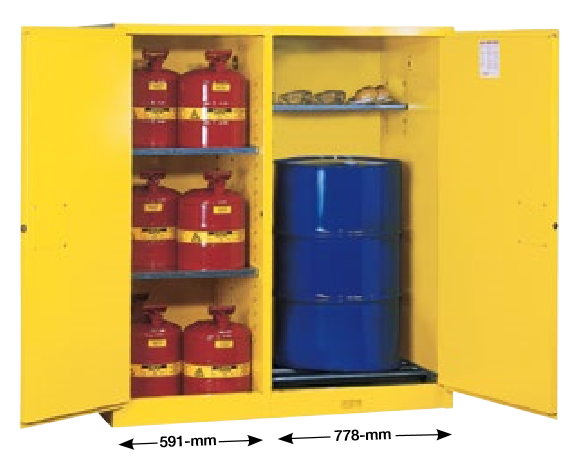 Double-duty yellow cabinets safely store flammable liquids. They feature two separate compartments that fit one vertical 55- or 30-gallon (200- or 110-L) drum and up to twelve 5-gallon (19-L) safety cans. Cabinets feature self-latching, three-point locking door for maximum protection under fire conditions. Latching system engages automatically when the door is pushed closed. Cabinets include drum rollers in the sump and one half-depth shelf in the drum compartment plus two full-size adjustable shelves in the can compartment. Sturdy 18-gauge (1-mm) double-wall steel construction offers excellent durability. Self-close model features a fusible link that holds doors wide open during use and melts at 165°F (74ºC), allowing the doors to close automatically in the event of a fire.